Speldosa make their first visit to the club. 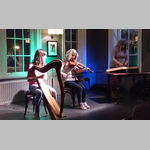 They are made up of Rosie Calvert (The Teacups), Nicola Beazley (Ceol Tire) and Emma Durkan (Caleb Major Band), who are all recent graduates of the Newcastle University Folk and Traditional Music degree. With fiddle, clarsach, hammer dulcimer and vocals, they play an unusual combination of beautifully delicate traditional and contemporary tunes, along with gutsy feminist songs and original compositions.